...and Alphabet Activity Ideas! This page is full of ideas for using our Alphabet Printables and Printable Alphabets for learning the alphabet, as well as for playing alphabet games. Ideas range from learning and recognising numbers and letters, to practicing alphabetical order and expanding vocabulary, so you should find something appropriate for all ages. 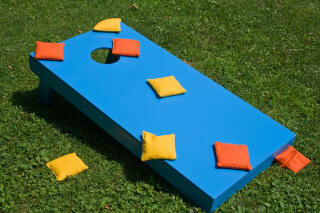 And don't think they are just about learning - there are some really fun game ideas here! Use our Alphabets in Scrapbooks. Use them to decorate your scrapbook pages, or spell out your child's name on a school folder or workbook or file. Children love to mark their own territory with their name on their bedroom door! Depending on age they can perhaps colour and cut their own sign, which can then be laminated for durability if you wish. Print and laminate your child's initial, make a hole and attach to a key ring. Or use a ribbon or string to decorate a school bag or satchel so that your child will easily identify it. Teachers will come up with all sorts of ideas for using the alphabets on bulletin boards and around the classroom. 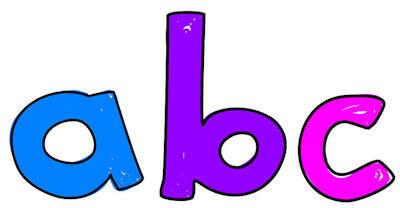 Print out our alphabets and display it where little ones will see it all the time! You may want to choose lower case letters for the UK, as most children are introduced to these first. Go through the alphabet regularly, pointing to the letters and saying the sounds they make; of course you can also sing the alphabet song! Cut out one of the alphabets and place them in a never-ending path or circle, like a board game. You can place them in random or alphabetical order, and either stick them to the inside of a file folder so that you can use them again, or just place them down on a surface so that you can vary the game each time. Provide each child with a counter and a piece of paper and pencil. The children choose a letter and place their counter on it, writing the letter on their piece of paper. Now take it turns to roll one or two dice and move around the board. Wherever your counter lands, write down that letter on your paper. The first child to find a three-letter word using their letters wins. Older children can play with four or five letter words. You can also print out extra copies of the vowels and most popular consonants and use more than one of them on your "board". Print out a set of alphabet cards and choose a combination which makes a word appropriate for your child's age. Scramble them up and have the child put them in the right order. You can make this game more energetic by "hiding" the cards around the room and telling the child how many cards he has to find. It is also a fun team game: use two different sets of alphabet cards and the kids will have great fun running around each other trying to find where their cards are hidden without giving away cards to the other team! Create a trail of alphabet cards around the room (or house), spelling out a word or short sentence which the child will need to write down in a little notebook and present to you when he reaches the end. You can make this more difficult for older children by throwing in "extra" letters which he will need to identify and exclude. Lay out a set of alphabet cards in alphabetical order. While the children close their eyes, take one card away. On your command they open their eyes and identify which letter is missing. Use a set of alphabet cards and 3 containers (bowls, paper plates etc) marked "beginning", "middle" and "end". Shuffle the cards and have the child turn them over one by one and place them in the appropriate container according to their position in the alphabet. Younger children could do this with the help of an alphabet strip. Using a set of alphabet cards, turn one over at a time and try to identify as quickly as possible the letter before, the letter after, or both! Younger children could use an alphabet strip to help. Simply shuffle up a set of alphabet cards and put them back into order as quickly as possible. Give each player a piece of paper and a pencil, and shuffle a pack of alphabet cards. Decide on a "theme" such as flowers, girls' names, cities etc. Turn the top card over and, in a given amount of time, see how many words you can write down which begin with that letter. You can control this game more by deciding after the card is turned over what the theme will be. A shorter and easier (and noisier) variation of the game is to decide on a theme for the whole game, and to try to shout out an answer as quickly as possible for each letter. Perhaps the winner of each round could take a counter and at the end of the game the counters are tallied for the winner. You can use the printable alphabets to make magnets, by laminating them and attaching magnets to the back. Choose a word and find the correct letters to assemble for your child. Challenge them to change the word to another by swapping one letter at a time. For example, change "cat" to "cot" to "cop" and so on. Print out two sets of alphabet cards (you could print one set of upper case and one set of lower case if appropriate) and deal five cards to each player. Place remaining cards in a stack face down in the middle of the table. Players check their hands for any pairs, and place them face up in front of them if they have any. The youngest player then asks a player of his choice whether he has a particular card. If he does, he must hand it over, and the pair can be placed on the table. If he doesn't, he says "Go Fish", and the first player must take a card from the centre pile. The winner is the first player to put all their cards down on the table. You need at least three players. Print out two sets of alphabet cards, and include one blank card too. Doctor the set so that there are enough cards for each player to have between 6 and 8 cards (less for younger players) and the pack is made up of pairs plus the extra card - you will have an odd number of cards! Shuffle and deal out the cards. Each player checks their hands for any pairs, and places them face up in front of them if they have any. The youngest player then turns to the player on his left, and takes a card (without looking at it!) from his hand. If it makes a pair with one in his hand, he can put it down on the table. Play continues around the circle until one player is left holding the odd card and is called the "Old Maid". Print out and join together an alphabet strip of lower or upper case letters (laminate if required). Write the other case of letters onto a set of wooden clothes pegs (you can usually buy these very cheaply at a pound / dollar store). Ask your child to clip the clothes pegs at the correct place on the line. Print out a set of alphabet cards. Deal them evenly between two players. Players turn over the first card on their pile simultaneously, and call out if their card is closer to the beginning (or end) of the alphabet. They take both cards. The winner has the most cards when the pack is completed. Make two copies (or how ever many you need) of a set of alphabet cards. Lay the cards in alphabetical order, replacing one of the letters with the ? card or a small object. Ask child to identify the missing letter or number. (We used a small toy spider called Spot and I would ask the children "what letter has Spot eaten"?) You could also spell out words and ask what the missing letter might be. Print out our chunky mitten alphabet match up cards for kids to practice recognition of upper and lower case letters. Perfect for the winter classroom. Obviously they will take some cutting out, but if you laminate them they will last!